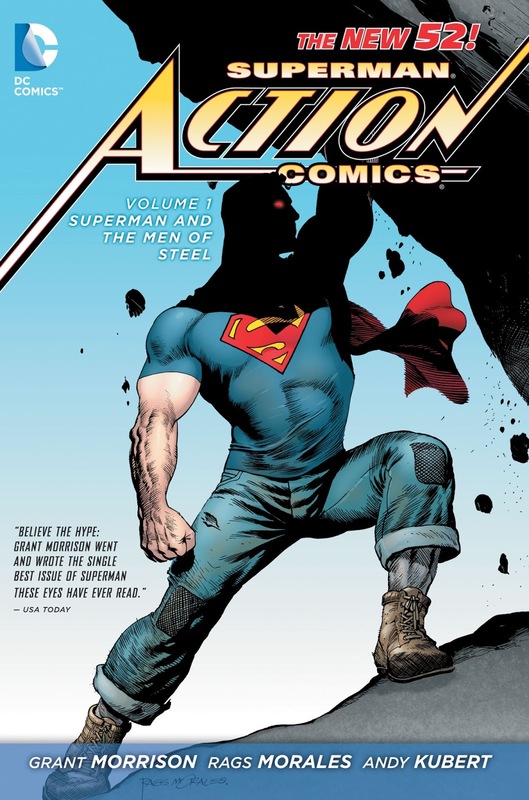 After some mulling over the Man of Steel movie I have found myself drawn back to Superman as a character and recently picked up the Action comics trade paperback, Volume 1. If the store I was in had stocked it I would most certainly have picked up Superman Volume one as well. 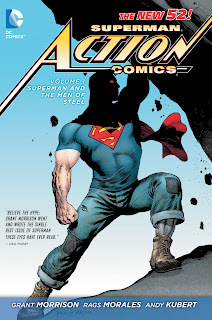 The events in ‘Action comics’ take place some time before the rest of the New 52 (I’m sure it will be made clear in at some point during the story but I get the impression is about six years before.) We see a young superman trying to learn how to use his powers. Not yet able to outright fly but instead leaping from place to place (mirroring the original origin of the character) wearing jeans and oddly, a t-shirt with a superman emblem on it. The story progresses with superman being less than popular with, well, just about everyone. This all changes however when an alien intelligence (Brianiac) comes to destroy the world (or capture it. It’s not really very clear) soon enough Superman is earths only hope against an alien force. The army send a metal clad super soldier after superman but he soon falls to the alien AI. Most of metropolis has been ‘bottled’ and taken away. In a complete 180 degree change of opinion the military forces give Superman a few bits of equipment. With a running start he manages to leap into space and latch onto the invading AI’s ship. It’s a simple story with a nice amount of characterization and foresight. As origin stories go its pretty great because it speeds over all the usual stuff in a well written way that while being traditional it’s done in such so concisely that it’s too short to actually become tiresome. There are a few moments on Krypton with a baby superman that appears a little older than in other versions of the story. All of the elements of the story are very well done and perfectly in tone with the New 52. One of the elements that I enjoyed was the inclusion of Doctor Irons (Steel) in this story as an ancillary character he even had a nice backup story that really lets you see him becoming a hero. There was very little about this superman story that could have been improved on. If I forced myself to make a critical comment then I would have to say that there was not enough interaction with the team from the Daily Planet and very little exposition about Clark and Jimmy’s apparent bond. There are a few over done artistic moments especially towards the end when we see an awkward toothy smile from our man of steel that seems to fill the upper right of the page at something of a strange fish eye perspective. As I said earlier the ‘Steel’ portion of the backup to the main story is very interesting and well done but the second backup story is a strange time travel tale that was difficult to follow and had no real purpose within the larger story. Maybe it will come back at a later point in the continuity but up to the point I read it was just a mess of a narrative with no outcome that meant anything to the continuity of the rest of the trade.